Veracity has developed a family of innovative products to support IP Video projects. These solve practical problems in IP Video system design and deployment. The Veracity PINPOINT adapter solves a common problem. How do you view an image or the configuration page of an IP camera locally, without disconnecting it from the network and losing PoE power? By routing installed Power over Ethernet power to the camera, but diverting the network connection to your laptop or PDA, PINPOINT makes it possible to focus and set-up the camera quickly and accurately. Using PINPOINT however, a single installer can get the camera set up in considerably less time, while being able to configure the camera precisely for the best image possible. PINPOINT is compatible with the IEEE 802.3af PoE that is used by most IP cameras, as well as most PoE Plus and non-standard types of PoE up to 30 watts. An LED indicator confirms that PoE is being delivered to the camera. 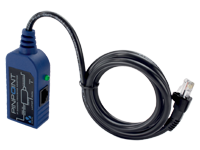 It is compatible with both 10BASE-T and 100BASE-TX Ethernet, and includes network crossover to enable direct connection to a laptop or netbook computer using a standard Cat5E patch cable (included). Simple, tough construction and compact dimensions mean that PINPOINT can be used again and again as a reliable IP video installation tool. [Find out more...] Veracity PINPOINT Camera Set-up Adapter "Technical Data Sheet", 1,000 kB pdf file.